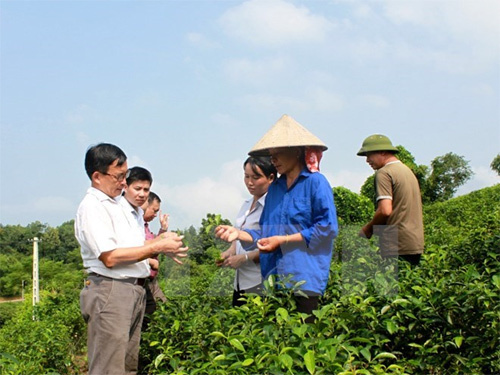 President of the Vietnam Fatherland Front Central Committee Nguyen Thien Nhan has described new-style cooperatives as the most important player in agricultural restructuring. The front leader was speaking at the 12th conference of the Vietnam Cooperative Alliance (VCA) Executive Committee in Hanoi on November 26. He elaborated on agricultural restructuring which looks towards large-scale production with key products, varieties of high quality and productivity, modern cultivating process in combination with processing, consumption and export. Praising the VCA’s role and contributions to the country’s socio-economic development and stability, Nhan urged the alliance to complete a roadmap for the implementation of the new-style cooperative model. The alliance must join hands with the Ministry of Agriculture and Rural Development, the State Bank of Vietnam, the Ministry of Finance and localities to speed up the work with an aim of having at least a cooperative in each district recognised as new-style one in 2016, he said. However, the official pointed out a string of bottlenecks such as dropping prices despite bumper harvests, the lack of production capital, farmers’ low income and unstable agricultural export in terms of both price and quantity. He blamed the incompatibility between agricultural production and the current market economic conditions as well as international integration process for the limitations. Vietnam now has more than 18,200 cooperatives with nearly 7.4 million members. However, only 10 percent of them are operating fruitfully while the remainder are closed or working half-heartedly due to the unsustainable connectivity among cooperatives and between cooperatives and businesses of other economic sectors./.